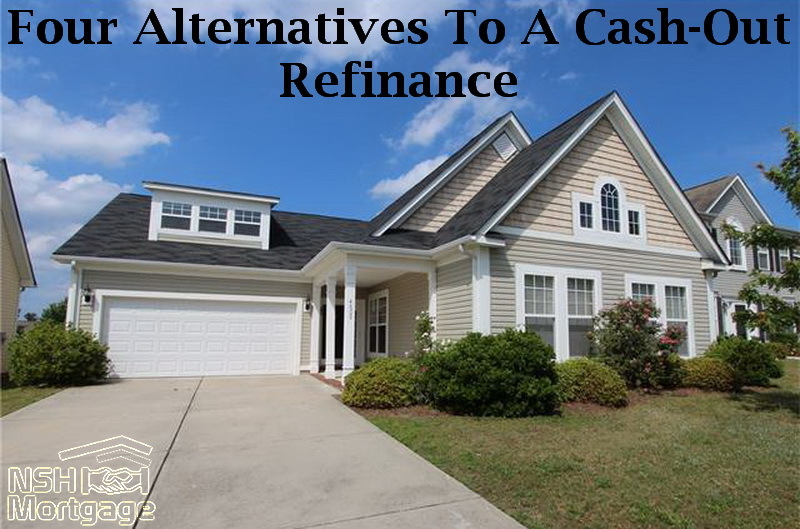 Four Alternatives To A Cash-Out Refinance. NSH Mortgage has the wisdom and tools to understand the alternatives to cash-out refinancing. If you need money for things like home improvements, debt consolidation, or investments, you may be tempted by a cash-out refinance. That means you can refinance with a larger loan than you need to pay off your old mortgage, and take the difference in cash at the closing. This refinance might be the best and cheapest source of funds, but it could also be an expensive mistake. Here is what you need to know before you apply and some mortgage programs that can assist you with any mortgage questions you require answers with. The biggest drawback of most cash-out refinancing is the added fee, and the way lenders calculate it. Fannie Mae, for instance, charges .375 percent to 3.125 percent of the entire loan amount in risk based surcharges for a cash-out refinance. That is right you calculate the fee based on the entire loan amount, not just the cash out. If you want a relatively large amount of cash, the deal may make sense, because mortgage rates are usually much lower than other types of borrowing. However, if your loan amount is large, and the amount of cash is not, it could be an expensive way to borrow. Suppose you refinance a $400,000 mortgage, with an additional $20,000 in cash out. If your surcharge is 1.875 percent, that is a cost of $7,875, which is almost 40 percent of the cash you want. You would be better off using a credit card or hitting up your local loan shark. A cash-out refinance is not quick cash you will repay fast. Underwriting and eligibility guidelines are stricter for these loans and they can take longer to close than shorter term financing. For instance, Fannie Mae allows you to purchase or refinance primary homes with 97 percent loans, since you do not take cash out. But you can only go to 80 percent if you want cash out. Loans that require minimum FICO scores of 660 for cash-out only mandate 620 scores for purchases. It is worth noting that you can avoid the surcharges and stricter underwriting by choosing government backed refinances like FHA loans and VA loans. Those programs have their own sets of upfront fees, though, and they may not make sense if you have significant home equity. Cash-out refinancing means you will have a bigger mortgage and probably a higher payment. You will also burn up some home equity, an asset just like your 401(k) or bank balance. This is not something to do lightly. In addition, taking a cash-out refinance means resetting the clock on your home loan. You pay over time by adding those extra years and interest to a new mortgage. Fortunately, there are alternatives that can be cheaper and safer. If the reason for your cash-out refinance is consolidation of consumer debt, consider other options before you take out this loan. Depleting home equity to pay of debt accrued buying things that do not outlast the debt is poor money management. This method of paying those debts free up your credit for you to spend yourself into financial trouble again. Then you might be tempted to do another cash-out refinance to pay this new debt, making this a vicious circle. Several Federal Reserve studies found defaults on cash-out refinances are higher than for regular refinancing. When home values fell a few years ago, homeowners who had tapped their equity often found themselves owing more than their property was worth. If either home values or your income drop substantially anytime during the loan term, you could face the loss of your home. Without equity, it is very hard to sell if you need to move or if your payments become unaffordable. When Is A Cash-Out Refinance The Best Option? The amount of cash you want is high relative to the balance of the loan you are replacing, and the terms of the new loans are better than those of your current loan. You need a large sum and want a government backed loan and will finance more than 80 percent of your home value. Government loans like FHA loan and VA loan let you take more cash and do not have risk based surcharges. Ask lenders to show you other refinancing options that can help you compare costs when you are considering to use cash-out refinancing. This is often a better financing strategy if you do not need a large lump sum for a big purchase or project. A HELOC also makes good sense if you already have the ideal loan terms. With its lower closing costs and added flexibility, a HELOC is usually less costly than a cash-out refinance, and it takes less time to close. There are not limitations on its use, and you only pay interest on the amount of credit used. You can use the funds for any purpose, including home improvement projects, annual costs like college tuition, or financing a gap in business revenue. Personal loans, also called signature loans, are faster to process and much easier to get than mortgages. You can use a personal loan for home improvements, debt consolidation, major purchases or other expenses. Instead of repaying the loan for 15 years to 30 years, you will pay this debt off in five years at most. The interest rate depends on your credit rating, and will probably be higher than that of a mortgage. However, the costs are low, and with a shorter term, you will still pay less than its life than with a cash-out refinance. It might also improve your credit by adding another line of credit to your credit history. This could be valuable if you have had recent financial challenges that damaged your credit. If you can improve on the terms of your first mortgage, that does not mean a cash-out refinance is automatically your best deal. Depending on the amount of cash you want, it might be less expensive to refinance your first mortgage with a cheaper rate and term loans, and then add a second mortgage. This can be a fixed home equity loan (best when you need a lump sum) or a HELOC (best for ongoing needs over time). If you have a vehicle loan that has high interest rates, see if you can refinance them. That will give you lower payments and the you can use the savings to pay other debt. Look at selling valuable collections, luxury items or things you are not using. If there is still debt left after your selling spree, see a credit counselor about restructuring that to pay it off. They also can help you develop better spending habits. Consider starting a side hustle using high demand skills you already have. Look for ways to generate income in the gig economy but carefully research their costs and legal requirements. Borrow from family, applying for zero interest balance transfer credit cards, or borrow against your 401(k) and deduct payments from your paycheck. These options reduce your debt load or give you better terms than a cash-out refinance or even other credit.